September is World Alzheimer’s Month! Alzheimer’s Disease International (ADI) spends the entire month raising awareness about Alzheimer’s and other dementias, and reducing the stigma that surrounds Alzheimer’s. Did you know that Alzheimer’s Disease has been linked to Hearing loss? 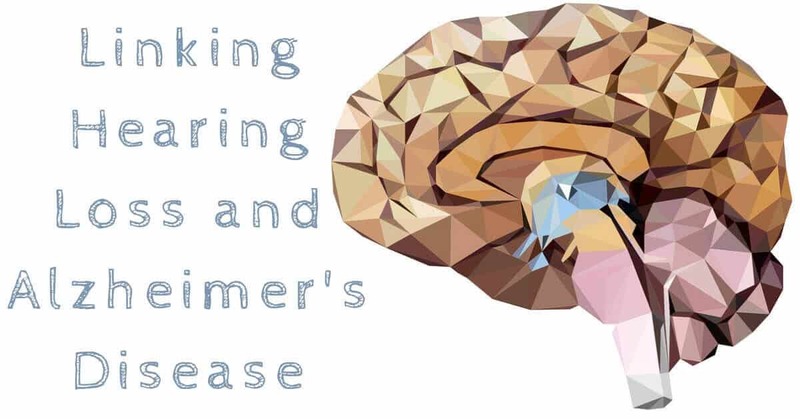 Numerous studies show that living with untreated hearing loss can increase your risk of developing dementia, and can lead to an earlier onset of dementia. Alzheimer’s Disease is a degenerative brain illness that targets the neural pathways in the brain. When cells can’t communicate, they don’t function correctly and are damaged and destroyed. Brain scans show that Alzheimer’s Disease, the most common form of dementia, causes the brain to shrink dramatically, explaining why those with Alzheimer’s Disease aren’t able to function normally. The first sign of Alzheimer’s is often memory loss and forgetfulness. This goes beyond simple absentmindedness, and someone with dementia is completely unable to remember certain past events, or might even forget where they are or how they got there. It’s common that someone with dementia might have a hard time remembering the time or the date, and may have difficulty performing tasks they’ve performed hundreds of times with ease, such a following a simple recipe, or brushing their teeth. A number of studies have linked hearing loss and Alzheimer’s. Even though we often dismiss hearing loss as a normal part of aging, adults with hearing loss are far more likely to develop dementia than adults who can hear. A 2013 study tracked 2,000 adults to see what effect hearing loss had on cognitive abilities such as memory, planning skills, and concentration. They found that those who had hearing loss were 24% more likely to experience rapid cognitive decline! Hearing loss sped up age related cognitive decline, and led to an increased rate of dementia or Alzheimer’s disease. Those who had the worst hearing at the beginning of the study were the most likely to experience dementia, and compared to people with normal hearing, were at triple the risk of developing Alzheimer’s Disease. Someone with hearing loss is more at risk of dementia from something that researchers call “cognitive load”. This refers to the constant strain on the brain from working so hard to hear. “If you put in a lot of effort just to comprehend what you’re hearing,” says Arthur Wingfield, professor of neuroscience at Brandeis University, “it takes resources that would otherwise be available for encoding what you hear in memory.” Since you use so much of your brain power just straining to hear, you don’t have enough left over for cognitive tasks like concentration or memory, and increase your risk of developing Alzheimer’s Disease. Can getting hearing aids really prevent memory loss? Scientists think so. Two-thirds of Americans over the age of 70 have hearing loss, and if you’re one of them, treating hearing loss could do far more than save your ears. Since living with untreated hearing loss has some major consequences, the best thing you can do for your brain is treat your hearing loss. Studies show that those adults who treat their hearing loss don’t experience a greater risk of dementia, and have the same rates of Alzheimer’s Disease as their hearing peers. If you have hearing loss, hearing aids could give you far more than clear hearing. Not only will you be able to follow conversations easily, hear all the sound around you, and be able to do the things you love, you’ll be keeping your brain healthy and active, and reduce your risk of developing dementia or Alzheimer’s Disease. If you or a loved one has memory loss, or any of the other early signs of dementia or Alzheimer’s Disease, visit your family doctor as soon as possible. Then, visit us at Roseville Diagnostic Hearing Center to see what a hearing aid can do for you. After a hearing test that will determine your unique hearing needs, our team of hearing specialists will help you find the device that will fit your lifestyle, hearing needs, and budget. This September, do the right thing for your brain. Call us today to book an appointment, and take the first step towards clear hearing and a healthy brain.